Looking For a New Home In HOUSTON? Visit Riverstone! Riverstone is located southwest of Houston in Fort Bend County. The community's 3,800 acres contains homes with Missouri City and Sugar Land addresses. With easy access to several major freeways, Riverstone is well connected to the many amenities that Houston has to offer. Take US-59 south about 14 miles to the Highway 6 exit. From US-59 in Sugar Land, turn left on Highway 6 (south), continuing about three miles to the entrance of Riverstone. Take a right at the community's main entrance on Riverstone Boulevard then right on University Boulevard. The Club at Riverstone is located a few miles ahead on the right at 18353 University Boulevard, 281.778.2222. Take Main (Hwy 90A) to the Fort Bend Toll Road. Follow the Fort Bend Toll Road south for approximately 10 miles to Hwy 6. Take a right on Hwy 6 and follow for four miles. Then take a left onto Riverstone Boulevard and right on University Boulevlard. 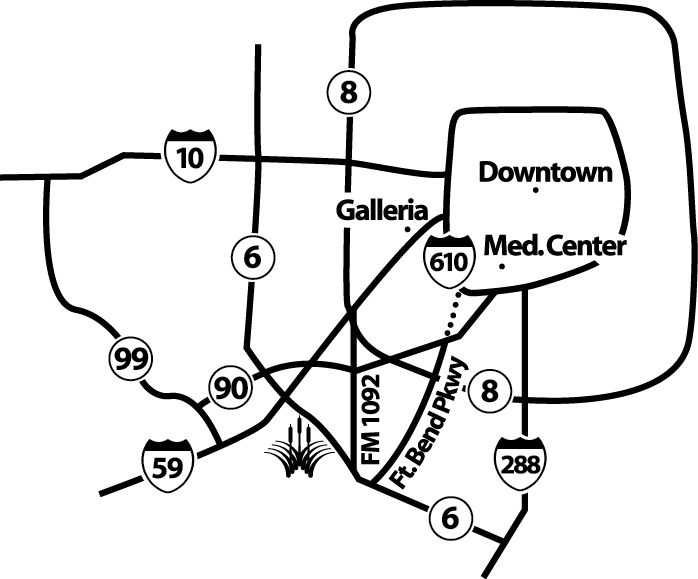 The Club at Riverstone is located a few miles ahead on the right at 18353 University Boulevard, 281.778.2222. Learn more about our Fort Bend County homes by contacting us today.